A few months back, on a trip to the mountains in North Georgia, I made a pit stop at Panorama Orchards in Ellijay. It was quite a find, really. They had shelves and shelves of apple-based products they had made – apple BBQ sauce and apple salsa being two of the scores (the salsa was great on grilled pork!). They, of course, had apples for purchase. One variety that was new to me was the Mutsu apple. 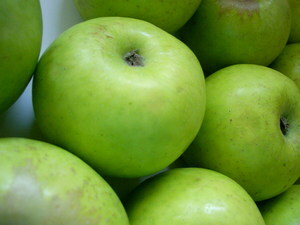 After trying it, I decided that the Mutsu was the perfect apple. It’s has firm flesh and lots of crunch & bite to it. It tart like a Granny Smith but not quite as sour with enough sweetness to balance it out. It was a treat to eat alone…but it made me start thinking of a way to bake with it, too. I’ve always wanted to try to make a dessert that had rosemary in it. About 8 years ago, I had rosemary Merlot sorbet…and I’ve never forgotten it. It was the perfect mix of sweet and savory with such a clean taste. Why not achieve it with a tart? Tart, crunchy apples on a buttery crust with a sprinkle of rosemary and a dusting of sugar. The result was spectacular, if I do say so myself. It had the balance of rich, light, sweet and sour…and there was a whisper of rosemary flavor in each bite. 1) Roll out prepared puff pastry. Cut into two pieces. Fold edges over about 1/2", making the crust. Sprinkle with sugar. 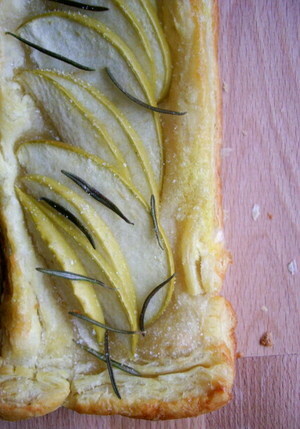 2) Lay layers of apples on pastry to desired thickness. I would say one apple per tart would be more than sufficient. 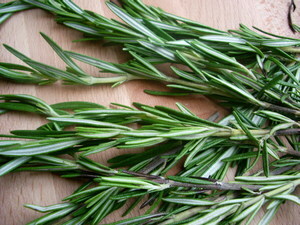 3) Pull individual leaves from rosemary sprig and scatter evenly across tart. Brush edges of pastry with melted butter or egg wash and sprinkle the whole thing again with sugar. 4) Bake according to your pastry package’s directions and the moodiness of your oven at home – my tarts took about 10-12 minutes at 350.
oooo that is very beautiful girl. green apples sound so good right now…so does pastry..mm. Did I mention I’m ‘kind of’ fasting today?? I need buttery sweet pastry and apples before I pass out..lol. This is the kind of thing that interests me. I love new tart ideas. This was is visually appealing and I bet tastes very unique. Well done! Take that Peter Wells! That looks and sounds amazing! That looks and sounds phenomenal! Brilliant! That is a thing of absolute beauty, my dear!